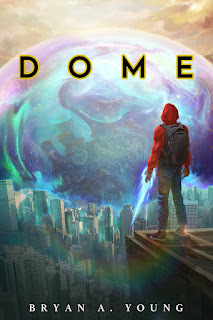 DOME is the story of Tye and four other teens that find themselves trapped in a mysterious impenetrable dome that has engulfed the Angeles National Forest. Inside, they soon discover that not only has the forest around them been changed into a completely alien environment but that they all have powerful new superhuman abilities. In their attempt to escape, they come to find out that the only way of freeing themselves is to complete three trials set up by the creators of their alien prison where they must combat powerful foes in order to push them to their absolute limits physically and mentally. If they fail, the dome will expand over the planet, terraforming their home and killing all life in the process.